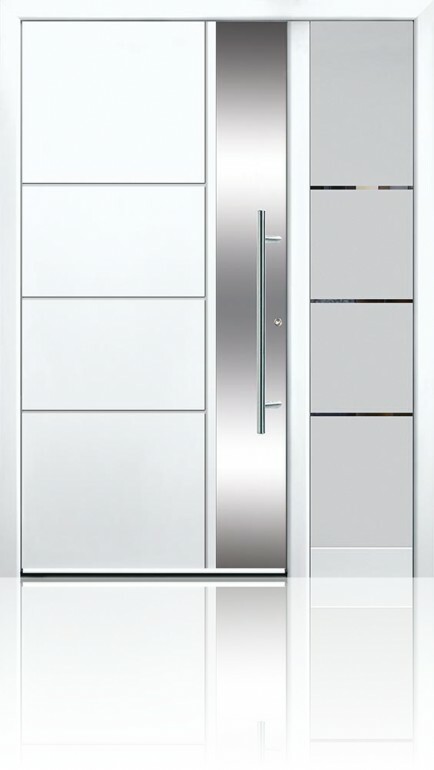 A deep grooving effect and a large stainless steel panel give the Groke 12960 an ultra modern chic look. 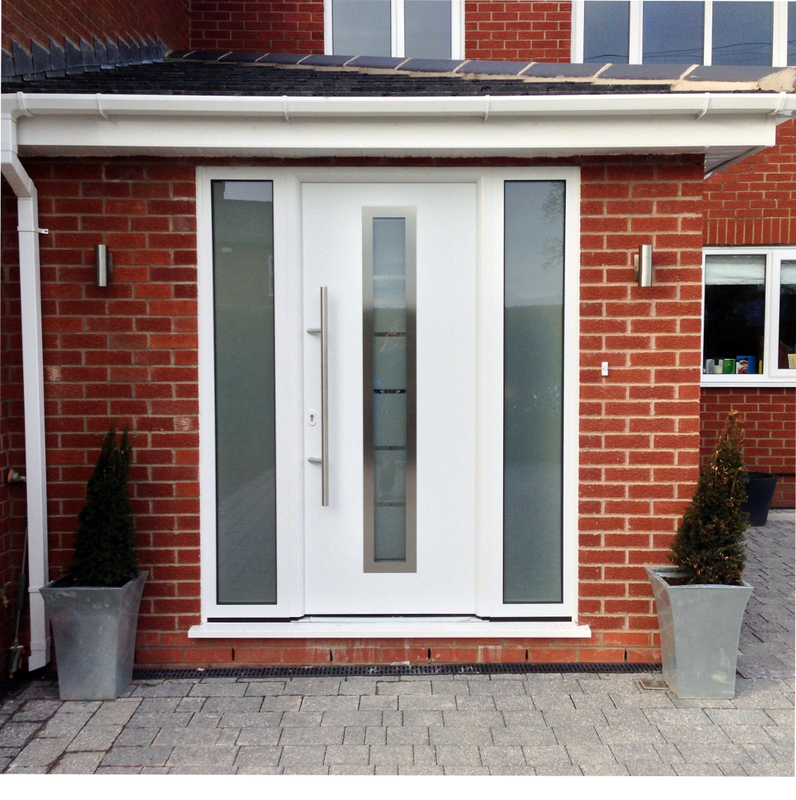 Groke are a leading manufacturer in Germany of aluminium front doors. Every door is purpose made using a combination of craftsmen’s skills and state of the art manufacturing. We will go through with you all the options to ensure that the door is right for you. You will be provided with a visual image of how your Groke 12960 will look as well as a technical drawing. Once both of these have been approved your front door will go into production. Groke 12960 is available in three versions. There are 34mm, 44mm and 94mm thick panels. 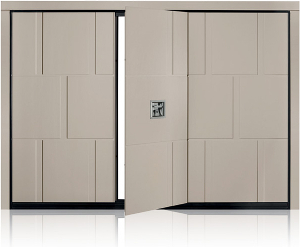 Your choice of panel thickness affects both the look of the door and the thermal transmittance value. All three versions are built on to the same 90mm thick aluminium profile. The 34mm is rebated onto the profile. The 44mm overlays the profile on the outside face of the door. The 94mm panel overlays the profile on both sides of the door. The 94mm achieves a thermal transmittance value of U=0.76W/m2k making it suitable for low energy homes. More information on this on the specification tab below. As standard your Groke 12960 is tested and certified to the German security rating WK 2. In the test, the door has to withstand an attack from burglars’ tools such as screwdrivers, pliers, wedges etc. Groke side and transom elements are manufactured as part of the overall frame structure and are not screwed on. This improves both the look and the strength of the product. The glazing in the side elements can also be designed sympathetically to the design in the leaf. See the image above whereby using sandblasting, the stripes in the glass marry up with the grooves in the door leaf. Once you’ve decided the 12960 is the design of your choice, you can set about making it your own. You will be able to choose the colour on the outside, colour on the inside, frame colour, and door furniture. That items are just the aesthetics there is also the functional features to choose from such as panel thickness and security upgrades. Ready to get a quote? Call us now, we can’t wait to hear from you. Our highly trained fitters can install anywhere in the North West of England or we can also supply only anywhere in the UK. Multi-point locking – 3 point locking as standard with option to upgrade to 5 point locking. Automatic locking also available.